Little is known of Paul Hoeniger’s early life except that he studied in the Academies in Berlin and Munich and at the F. Skarbina School in Berlin. In 1891 Paul traveled to Paris to study with the Impressionists and was drawn, and influenced, not only by the work of Pissarro, but by the Belle Epoch scenes of Jean Beraud. While living in Paris he made many excursions to other cities and countries including Belgium and Holland where he studied the works of their current and past artists. Upon his return to Germany he executed many scenes of everyday life in Berlin and became noted for this genre – which he first learned in Paris. 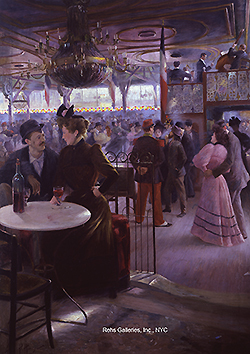 Between 1891 and 1912 he was a frequent exhibitor in Germany and participated in a number of exhibitions in Paris, including the 1895, 1898 and 1904 Salon exhibitions.